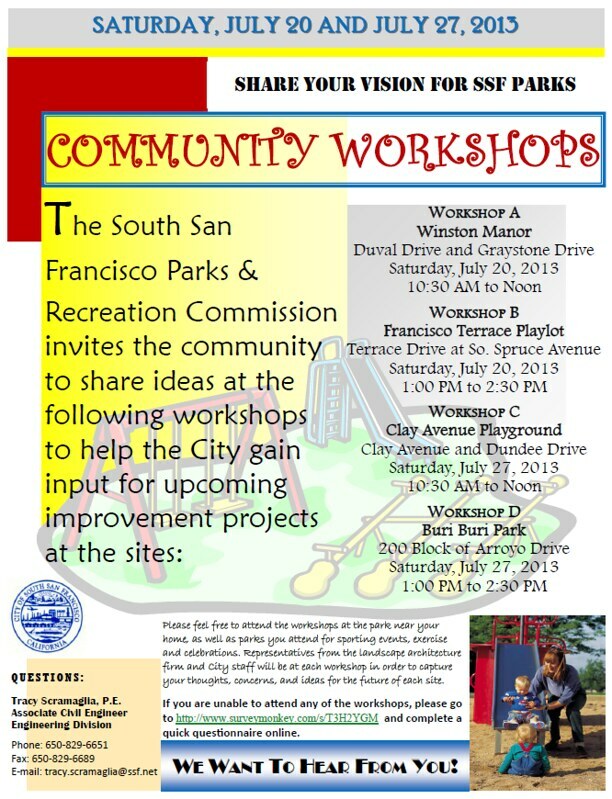 The city of South San Francisco is in the process of renovating the playgrounds located at Francisco Terrace Playlot, Buri Buri Park, Winston Manor #1 Park and Clay Ave Playground. If you are unable to attend any of the workshops, click here to complete a quick questionnaire online. For more information, please contact Tracy Scramaglia of the Engineering Division at (650) 829-6651. 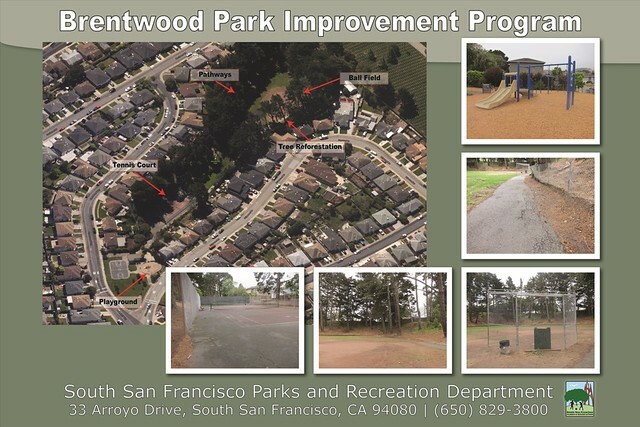 The South San Francisco Parks and Recreation Commission invites input on resident priorities for utilization of approximately $150,000 that is available for improvements at Brentwood Park. Options include one of the following: repair of the tennis court; replacement of the irrigation system which would conserve water and improve the condition of turf and landscape; replace the asphalt walkway around the perimeter of the field in the rear of the park; upgrade the playground equipment; upgrade the ball field; remove declining trees in the back of the park, and plant replacement trees; or other improvements. Thursday, July 25, 2013; 7:00 p.m. Feedback may also be provided by clicking here to complete a quick questionnaire online.